In honor of the slain leader, Venezuelan President Nicolas Maduro inaugurated the Martin Luther King University Complex in the state of Lara. 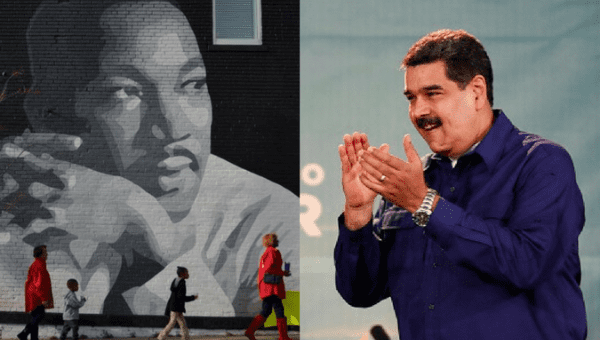 April 4 (teleSUR) Venezuela paid tribute Wednesday to Martin Luther King on the 50th anniversary of his assassination in which Venezuelan President Nicolas Maduro inaugurated the Martin Luther King University Complex in Barquisimeto, the capital of Lara state. The school is part of the government’s initiative to expand university education. More than 6,000 young people will pursue higher education at the complex. Maduro said the higher education institution “is named after this hero of the African-Americanpeoples” and will serve to promote culture, health and education for residents of underserved communities in the region. The Martin Luther King University will also have laboratories dedicated to mining Venezuela’s new cryptocurrency, Petro. Venezuela’s head of state also pointed out that 7.5 percent of the country’s Gross Domestic Product is invested in educational programs, unlike right-wing governments that preceded former President Hugo Chavez, which had invested a mere three percent in the sector. He also highlighted that Venezuela has the second highest university enrollment in South America, given that 77 percent of its higher education institutions are public. Martin Luther King Jr. Was assassinated on April 4, in 1968. In 1999, a civil trial in Memphis, Tennessee, which included testimony from 70 witnesses, reached a unanimous verdict that King’s assassination was the result of a conspiracy that included elements from the U.S. government.